In the Breviary of St Pius V, the four Marian antiphons for the end of Compline are each assigned to a specific part of the year; Alma Redemptoris Mater is said in Advent and the Christmas season, Ave, Regina caelorum from the evening of February 2nd until Spy Wednesday, Regina caeli in Eastertide, and Salve Regina from Trinity Sunday to the end of the liturgical year. Before the Tridentine reform, however, there was a lot of variation in their use. 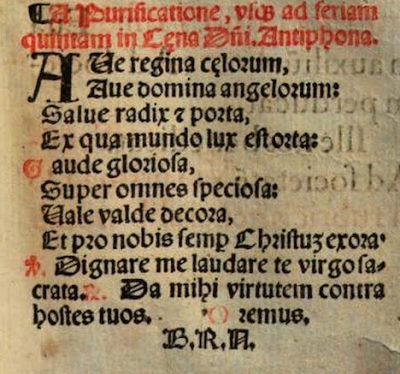 In a Roman Breviary printed for the Franciscans in 1529, the Regina caeli is assigned to the Easter season, but there are no rubrics about when to sing the others, and there is also a fifth antiphon, Quam pulchra; the same arrangement is found in the post-Conciliar Liturgy of the Hours, with Sub tuum praesidium added to the traditional group of four. Et pro nobis semper Christum exora. and Tomás Luis de Victoria (ca. 1548-1611). Here is the newer text, in a polyphonic setting with instruments by Juan Gutiérrez de Padilla, a Spanish composer born around 1590, who served as master of the chapel at the cathedral of Puebla, Mexico, from 1628 until his death in 1664.